In its September comprehensive revisions to all states’ Personal Income, the US Bureau of Economic Analysis (BEA) reduced its estimate of District’s 2014 Personal Income by $4.2 billion to $46.0 billion, down 8.5 percent. The reductions go back ten years, telling us that the District residents have been earning less than we thought they did for almost a decade. BEA’s revised estimates do not change the basic story that income earned by DC residents has grown over the past decade as population and jobs have grown. 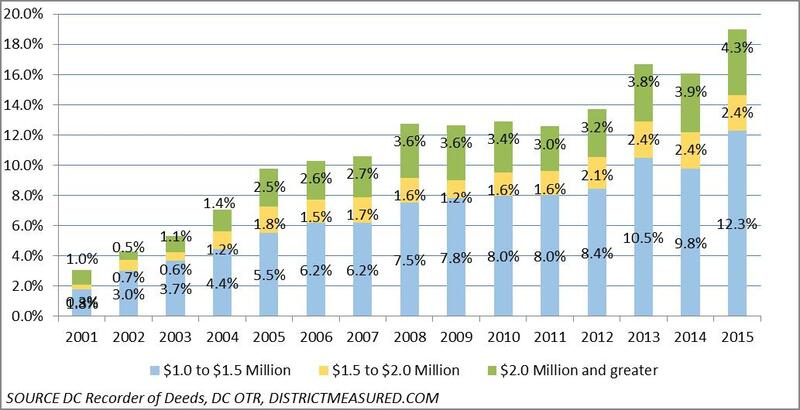 But the new numbers dial back considerably the proportion of the growing income earned in DC that stayed in the city. To calculate Personal Income, BEA starts with income earned in the District by everybody working in the city. Earned income is wages and salaries, benefits, and proprietor’s income. BEA then makes what is called a “net resident adjustment” to obtain income earned by DC residents. 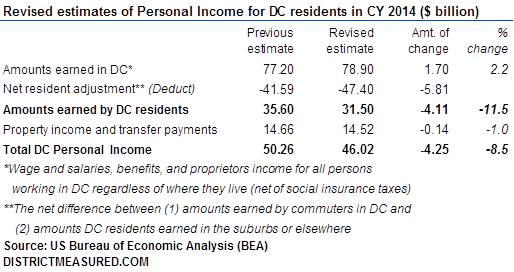 The net resident adjustment involves (1) subtracting income earned in DC by non-residents (mostly commuters), and (2) adding income earned outside of DC by DC residents. BEA 2014 revision increased by $1.7 billion the amount earned in DC, but also took $5.8 billion more away for the net resident adjustment using a new analysis of Census Bureau journey-to-work data and IRS tax filings. 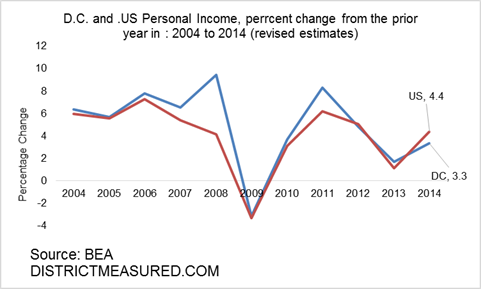 Revisions to the non-earnings portion of Personal Income were relatively minor. 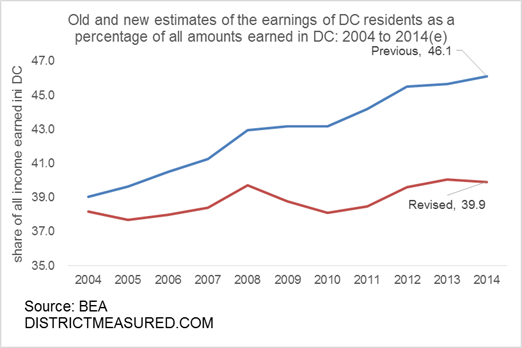 Before the revision, income earned by the District residents (in D.C. or elsewhere) appeared to be 46.1 percent of the income earned in the District in 2014 (by residents and commuters), up from 39 percent in 2004. The revision puts the 2004 share to 38.2 percent, and 2014 share to 39.9 percent. Here is another way to look at it: before the revision, we thought that the District residents accounted for 62 percent of the increase in all income earned in the District between 2004 and 2014. With this revision, this share is now closer to 44 percent. With these revisions, the increases in the proportion of income earned in DC staying in the city become more modest than what one might expect just by looking at the jobs numbers. From 2004 to 2014, resident employment grew 21.0 percent while wage and salary jobs located in DC increased just 11.8 percent. We have written about this before, considering explanations such as more DC residents working in higher paying jobs outside the District and more DC residents taking jobs vacated by commuters. New data gives us pause since it shows that the growth in the resident employment seems not to have been not accompanied by a similar measure of growth in incomes. We do not know why. The difficulty of tracking income flows in DC’s changing economy. There is nothing unusual about BEA revising its estimates as more information becomes available, but the scale of the September 30, 2015 revisions to DC’s Personal Income is unusual. The percentage revisions to DC’s Personal Income were far greater than for any state data. Over the past three years there were only 5 instances of state changes of more than 3 percent in any one year, the biggest being a 4.8% increase for Alaska in 2012. Why was DC so different? The reason is the net resident adjustment factor. Tracking the in-and out-flows among jurisdictions is one of the more difficult tasks in compiling earnings estimates, and those flows proportionately are much larger in DC than for any state. They also can be influenced heavily by the changes in job or residence location by a relatively small number of high income households. In its latest revisions, BEA turned to the most recent American Community Survey (ACS) data available for all US counties (the average for the years 2006 through 2010), along with the most recently available IRS tax data. Accurately tracking DC’s Personal Income is likely, however, to continue to be a challenge for BEA because DC’s population and economy keep changing—and the key data sources used to determine Personal Income are available only with a considerable lag. The new data still show that DC Personal Income grew faster than the US average from 2004 to 2014 (DC 59%, US 46%). Over the past four years, however, DC increases have been quite close to the US average, and in 2014 the 4.4% growth in the US exceeded DC by more than a percentage point. DC’s per capita income, now estimated at $69,828 in 2014, is 52% above the US average and is still the highest in the nation (compared to states). With higher population growth, however, DC’s per capita income has also grown more slowly than the national average over the past four years. The Data is from BEA’s Regional Economic Accounts. The latest data are available here. Last month the Office of the Chief Financial Officer (OCFO) issued an updated report on the District’s general purpose nontax revenue, which is largely comprised of charges for services, fees and fines. Nontax Study Report – 2015. We further compared the revenue composition of the District’s General Fund to that of five neighboring jurisdictions: the City of Alexandria, VA; Arlington County, VA; Fairfax County, VA; Montgomery County, MD; and Prince George’s County, MD. Intergovernmental transfers/revenue, such as payments from the federal and state/local governments are excluded from this analysis since our focus is on District generated revenue. For those who haven’t read about the results of the study as reported in the Washington Business Journal, here is another chance. The District appears to rely heavily on non-tax revenue sources, such as, fines and fees, when compared with neighboring jurisdictions. Based on our analysis, the significance of nontax revenue seems to be dependent on the level of government under consideration, i.e. whether it is a city, a county or a state. D.C.’s unique character may have contributed to this. 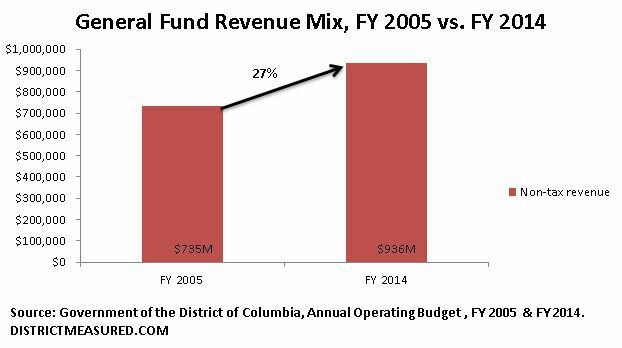 The percentage share of non-tax revenue in the District has been relatively stable, varying between 13 percent and 16 percent of the total General Fund revenue over the period FY 2005 – FY 2014. In terms of dollars however, it looks like the city’s non-tax revenue has gone up by about 27 percent. We also looked at the trend of the top ten nontax revenue sources to see if there was a single source of revenue driving the majority share of the 27 percent increase. We found that collections from Emergency Ambulance Fees, Traffic Fines and Building Permits were the leaders each growing at an average rate of 17%, 8.2%, and 8% respectively. Traffic related fines however consistently topped the list during the past ten years, FY 2005 – FY 2014. The table below presents the top 10 revenue sources in the order of the share they contributed to the total non-tax revenue base. We will have a series of posts diving into these top 10 non-tax revenue sources in the upcoming few months. What exactly is this data? The above analysis is based on the District’s Annual Operating Budget for fiscal years 2005-2014 and the FY 2014 Annual Comprehensive Financial Report (CAFR). Non-tax revenue is income earned by a government from sources other than taxes such as fees and fines. The rankings are calculated based on the total amount of actual revenue reported for each non-tax revenue source within the District’s system of Accounting and Reporting (SOAR) which was later rolled over into the CAFR. The dollar amount reported for Traffic Fines above is inclusive of past due collections of outstanding traffic related tickets by the District’s Central Collection Unit (CCU). Last week, the District received its results for two school assessment tests: the National Assessment of Educational Progress (NAEP) and the Partnership for Assessment of Readiness for College and Careers (PARCC). NAEP is a national test of reading and math skills given to 4th and 8th graders. PARCC is the District’s replacement for the DC CAS, and it is connected to the Common Core curriculum. The results reveal both good and bad news: District students made important gains in the NAEP scores, but the PARCC results for 10th graders show most high school students are not prepared for college. Demographic change among students taking NAEP in D.C. explains only part of the increase in NAEP scores the city has seen since 2005. When we control for changes in race, test scores still rise, just not as much. PARCC scores tend to be lower for high schools with larger at-risk populations, though some schools defy expectations, especially charters. The 2015 NAEP results were mostly positive for the District. Fourth graders posted statistically significant gains in both math and reading. Eighth grade reading scores were unchanged from last year and math scale scores saw a slight decline. The District’s NAEP scores have, for the most part, been increasing during the 10 year period we analyzed. Comparing multiple years of data could be problematic, especially in a city like ours where there are rapid demographic changes. Since 2005, the proportion of test takers in D.C. that identify as Black continuously declined while the proportion of Hispanic and White students steadily increased. Given that White and Hispanic students in D.C. consistently out-score Black students on NAEP, does the increase in NAEP scores capture an increase in learning or a shift to students who traditionally do better on such tests? To answer this question we looked at what would have happened to the NAEP scores if the demographics of test-takers in D.C. had stayed the same between 2005 and now. 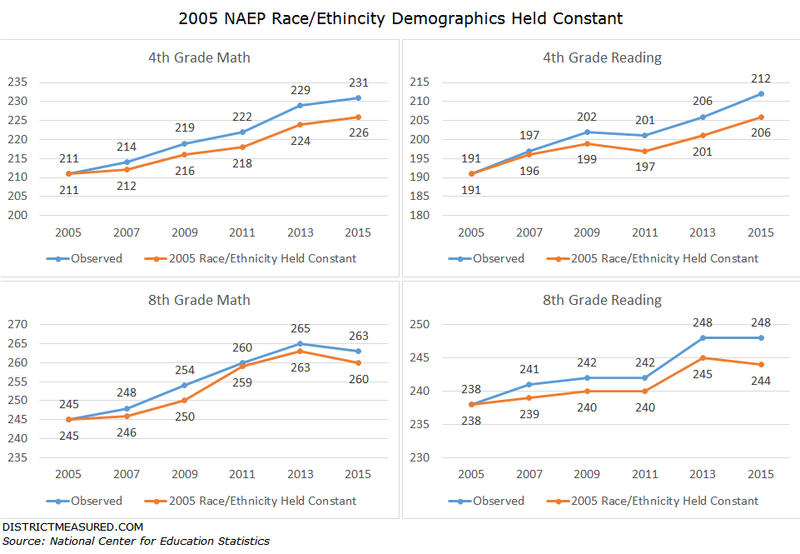 Our calculations show that even if the racial breakdown of students stayed the same, the District would have still seen growth in NAEP scores, but just smaller. That is, demographic changes influenced test results, but they cannot explain all the increases; it seems learning in the city’s schools has also improved. Here, we are collapsing all factors that affect learning into one: race. It is also possible that students moved up the socioeconomic ladder, regardless of race, or that some other change took place among students that would affect their test scores. However, the percent of test-takers who are eligible for free and reduced lunch has fluctuated from year to year, and NAEP results have increased not just across race, but across all subgroups such as gender, disability status, and ELL status. This we take as further evidence that learning has improved. If you want to further explore how the demographics of NAEP test-takers in D.C. have changed, check out this interactive graph of ours. And to see how the percent of students scoring proficient or above on NAEP in D.C. has changed over time, click here. Overall, the PARCC scores for D.C. high school students were pretty abysmal, with only 10 percent of students meeting or exceeding expectations in math, and 25 percent of students meeting or exceeding expectations in English. As the graph below shows, though, test scores for each high school varied a lot. The larger a school’s at-risk population, the more likely it was to have lower scores—though there were plenty of exceptions, especially among charter schools. For example, at SEED and Thurgood Marshall—charter high schools where about half of the students are at-risk—around 60 percent of students met or exceeded expectations on the English test (which is about twenty percentage-points higher than schools with similar at-risk populations). If you’d like to sort through the PARCC data yourself, and compare the scores at different schools for different types of students (black, white, male, female, etc. ), you can use the interactive graphs below. NAEP data is from the National Center for Education Statistics NAEP Data Explorer. PARCC data is from the Office of the State Superintendent of Education (OSSE), DC Public Schools, and the DC Public Charter School Board. At-risk data is from OSSE. An at-risk student is defined as a student who is homeless, in foster care, qualified for food stamps or TANF, or a high school student who has been held back a grade.